New data from NASA’s Cassini spacecraft and Deep Space Network provide the first geophysical measurements of the internal structure of Enceladus, suggesting that it harbors a large interior ocean beneath an ice shell. Researchers theorized the presence of an interior reservoir of water in 2005 when Cassini discovered water vapor and ice spewing from vents near the moon’s south pole. The new data provide the first geophysical measurements of the internal structure of Enceladus, consistent with the existence of a hidden ocean inside the moon. Findings from the gravity measurements are in the Friday April 4 edition of the journal Science. The Cassini-Huygens mission is a cooperative project of NASA, the European Space Agency and the Italian Space Agency. JPL manages the mission for NASA’s Science Mission Directorate in Washington. 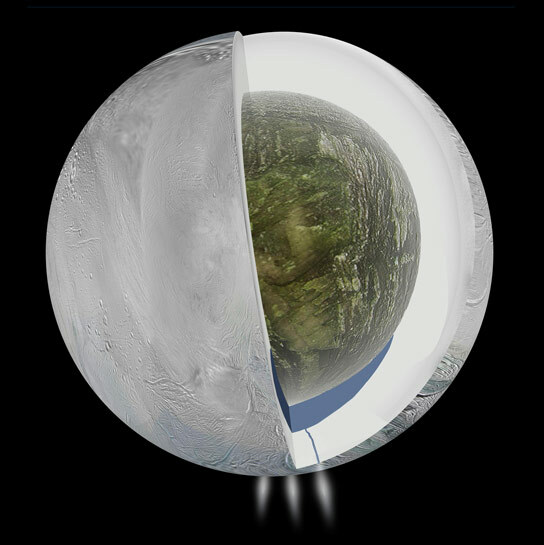 Be the first to comment on "NASA Detects Ocean Inside Saturn’s Moon Enceladus"